Obtenez ce transfert de bail pendant 28 mois pour des paiements mensuels équivalents U 347.90$/Mois +Tx apr s incitatif. Vous pourrez rouler 2,561 Km par mois. 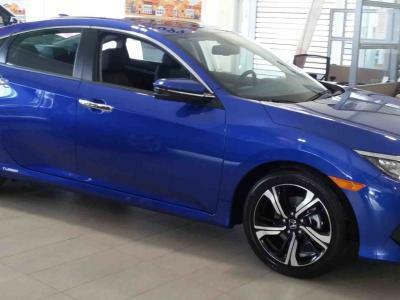 Up for grabs is the lease on our blue 2017 Honda Civic Touring sedan for $400 monthly all in ($200 semi-monthly, not bi-weekly payments). Comes with excess wear and tear protection and all weather floor mats. It\'s a 4 year lease that was taken out in August 2017. Super low mileage, only 8300kms on the odometer and you can drive up to 80,000km until the maturity date of August 15, 2021. Recently serviced in July and it\'s in like new condition. Notable features include the 1.5L turbo motor, adaptive cruise control, lane keep assist and other safety tech, heated front/rear seats with leather trim, remote start, wireless phone charging, Honda navigation and LED headlights. The final buyout is $12,920. The buyer will be subject to a credit check from Honda and will be responsible for the lease takeover fee of $750 + tax, non negotiable, as we have already made a $500 deposit towards the final price. Contact us on evenings and weekends if you are interested. Thanks!